Ladet euch die Testversion runter es lohnt sich. Da ja nicht jeder Release Notes liest hier mal eine Neuigkeit die viele Nutzer Virtueller Maschinen freuen wird. 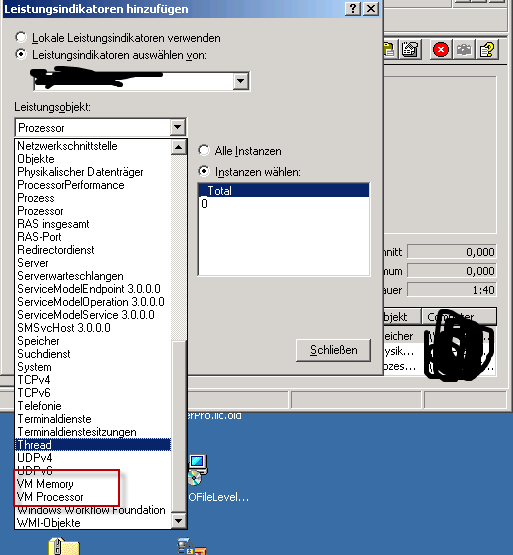 Folgendes Szenario: Man hat eine Windows 2003 Windows 2008 oder RHEL 5 VM mit einer virtuellen Harddisk und einem virtuellen SCSI Adapter. 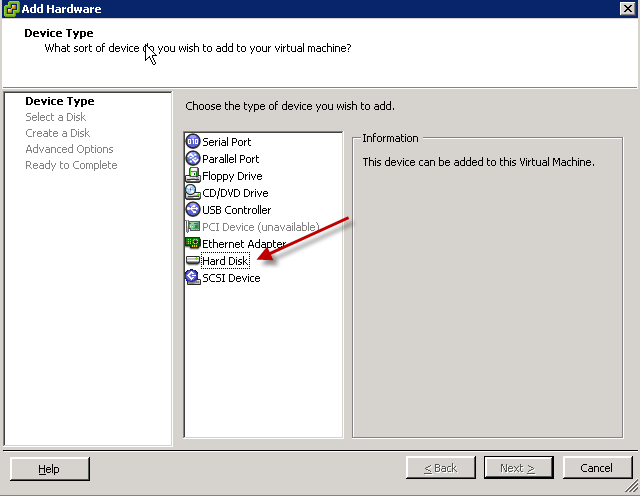 Man will eine 2. vDisk mit einem Paravirtualsierten SCSI driver, die neuesten VMwaretools sind installiert und die Virtual Harware version ist 7. Die zu editierendeVM muss heruntergefahren werden so das sich die virtuelle Hardware editieren lässt. Ganz wichtig bei der auswahl der SCSI Node ID muss eine ID zwischen 1:0 und 3:15 ausgewählt werden. Damit wird ein neuer Virtueller SCSI Adapter mit angelegt. Nach einem klick auf Next wird die neu erstellte VMDK und der neue SCSI Adapter wie gewohnt Fett dargestellt. Hier wie markiert den VMware Paravirtual anklicken und mit OK bestätigen. Beim nächsten Boot hat man seine Paravirtualisierte Disk. 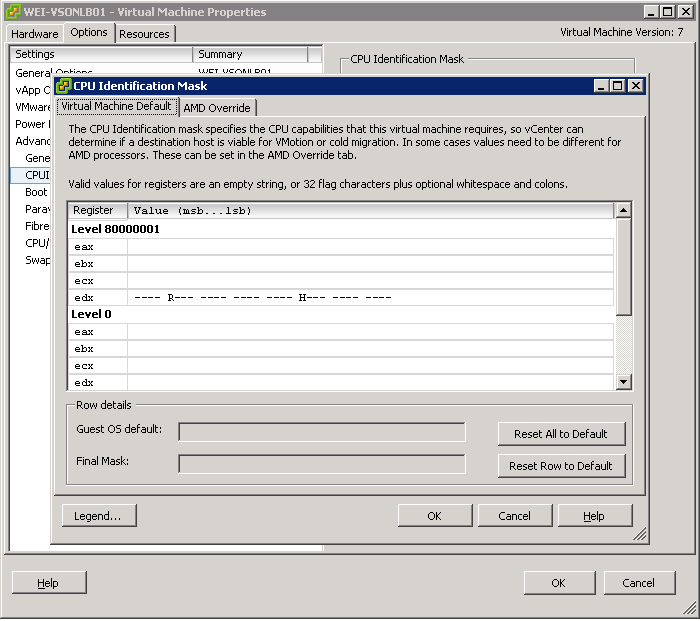 Im Moment ist der einzige Workaround den ich gefunden habe die VM wieder herunterzufahren und in den Advanced Options auf CPU Identification MASK einen Reset all to default zu machen. Nach dem Hochfahren kann man die Maschine wieder ganz normal per VMotion live migrieren. Heute also ist der Tag der Tage an dem vSphere offiziell GA wird. Ich lebe noch, hatte nur in den letzten Wochen so viel zu tun das ich nicht zum Blogen kam. aber es gibt noch vieles mehr was neu ist, ich gelobe in den nächsten Tagen mal wieder mehr blogen werde. New patches are available for ESX Server 3.5/3i. Please follow the instructions on the appropriate patch download page. ESX350-200804401-BG (Critical): Prevent DHCP from resetting the IP address and netmask when trying to acquire or renew a lease. Change the default multipath policy for all HDS modular storage arrays such as AMS, SMS, WMS, 9500V to “fixed”. ESX350-200804402-BG (Critical): Prevent the guest from stalling for a long time during snapshot operations. 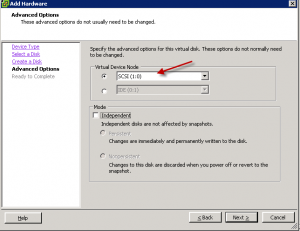 Prevent the ESX Server host from crashing during snapshot consolidation. 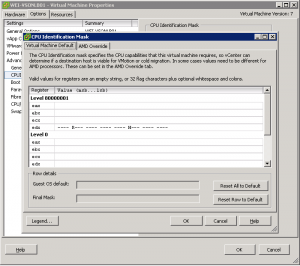 Prevent the ESX Server host from rebooting while powering on a vSMP virtual machine on a Unisys ES7000/one with eight or fewer logical CPUs. 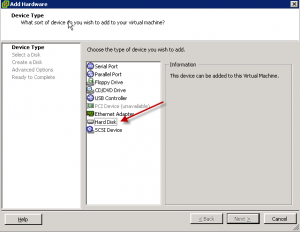 Fix emulation of instructions that access I/O ports. Fix emulation of string instructions on 64-bit guest operating systems. 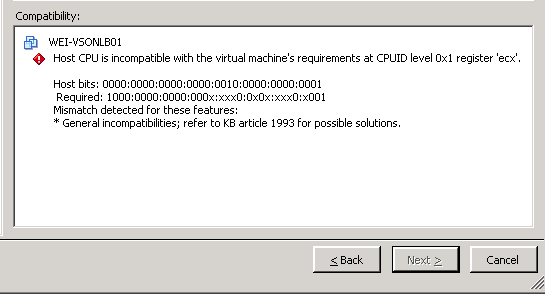 ESX350-200804403-BG (Critical): Prevent hostd from crashing due to incompatible entries in /etc/vmware/hostd/authorization.xml. Allow spaces in a password while creating and editing local ESX Server users through the VI Client. 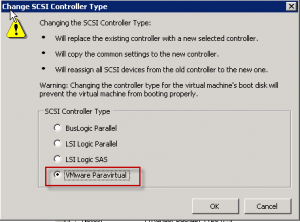 Set the executable bit for .vmx configuration files. 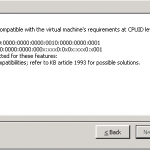 Fix a vmware-vpxa crash caused by invalid UTF-8. 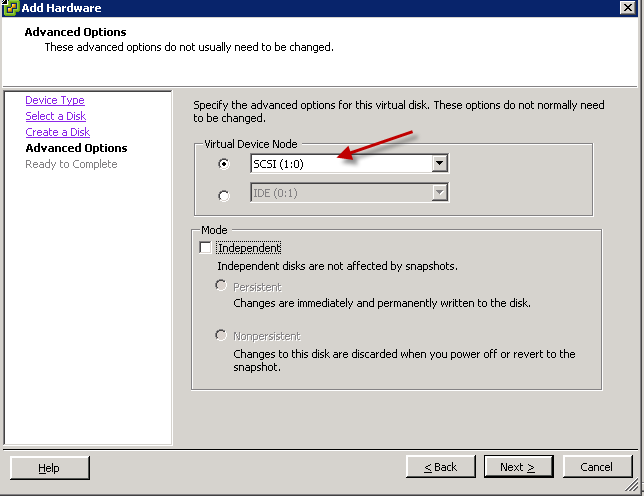 ESX350-200804404-BG (General): Allow Windows virtual machines to boot when DataDigest is enabled in software iSCSI. ESX350-200804405-BG (General): Include a megaraid2 driver fix for UNISYS platforms. ESX350-200804406-BG (General): Add support for the Intel PRO/1000 PF Quad Port Server Adapter. ESX350-200804407-BG (Critical): Add support for the Broadcom HT-1100 SATA/IDE controller. 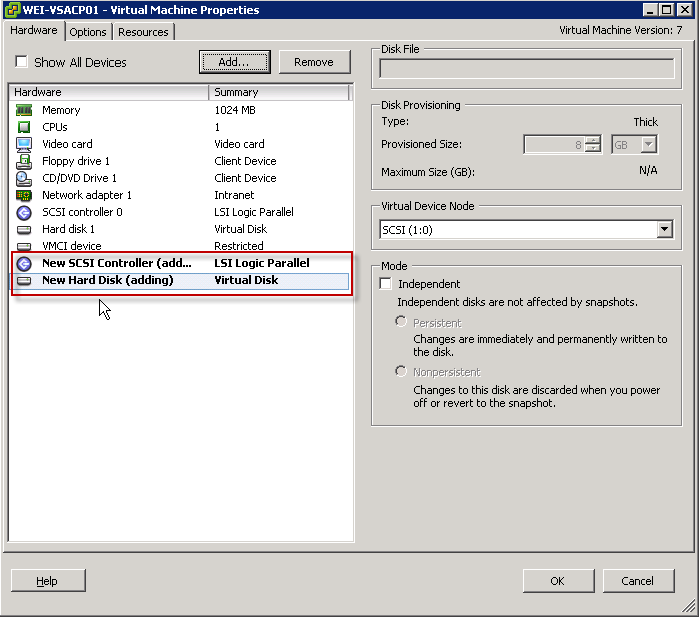 Prevent path thrashing during an Invista all paths down condition. ESXe350-200804401-I-BG (Critical): Fix typographic errors in the message strings of storage controller battery status, which is displayed in the VI Client. Include fixes for issues addressed by the following 3.5 patch bundles: ESX350-200804401-BG, ESX350-200804405-BG, ESX350-200804405-BG, ESX350-200804403-BG, and ESX350-200804407-BG.